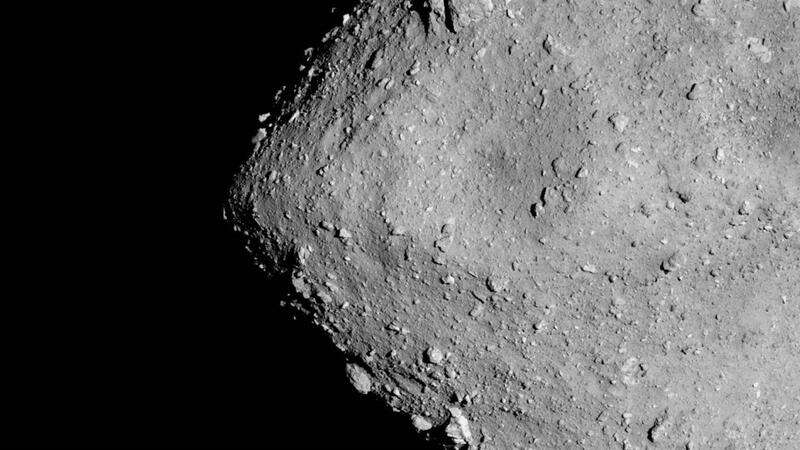 The Japanese Hayabusa2 space probe photographed the asteroid Ryugu from an altitude of six kilometres while searching for a landing site for MASCOT. The German-French landing device, developed and built by DLR, separated from Hayabusa2 on 3 October 2018 and reached the surface of Ryugu after a freefall lasting six minutes. The four experiments operated for more than 17 hours. Credit: ©JAXA/U Tokyo/Kochi U/Rikkyo U/Nagoya U/Chiba Inst Tech/Meiji U/U Aizu/AIST. The asteroid shown on the magazine cover is more than 300 million kilometres from Earth. Opinions were divided in the choice of the cover image. What should be shown: MASCOT or Ryugu? Should the photo be of the lander shortly before touching down on the remote celestial body or show the final destination of the mission, the asteroid Ryugu? The uniquely detailed view of the celestial body won. More details about the mission, which is breaking new ground in space exploration, can be read in the magazine article 'MASCOT in Wonderland'. Not every conflict can be solved so easily. For example, the general desire for mobility conflicts with the demand for quietness by residents living next to main traffic routes. DLR scientists are therefore looking for solutions, including for quieter aircraft. The Low Noise ATRA project demonstrates how structural modifications can reduce aircraft noise. One of the other subjects is automation in rail transport. If the train driver 'only' monitors the journey, the risk of fatigue increases. DLR rail researchers are investigating this issue more closely and present their suggestions. The use of satellites also has two sides. Their value for remote sensing of the Earth and terrestrial communications is undisputed - but their disadvantage is that repairs in space are hardly possible, dangerous and expensive. DLR engineers are now exploiting the advantages of holography to develop robotic solutions. DLR also has a suggestion in case conflicting interests might endanger the end-of-year harmony in the private domain. The reviews offer something interesting for young and old, from how the Moon has inspired humankind through to robots. Even a conflict of interest between a desire for Christmas romance and a more rational enthusiasm for technology can be dispelled, as in Dresden both can be experienced very closely together: a Christmas market with medieval flair and means of transportation of all kinds in the Transport Museum. In its museum series, DLRmagazine presents The palace of horsepower.